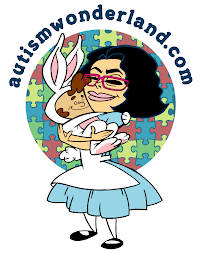 AutismWonderland: This is NOT Autism Awareness. Using a child's photo without a mother's permission is wrong. This is NOT Autism Awareness. Using a child's photo without a mother's permission is wrong. 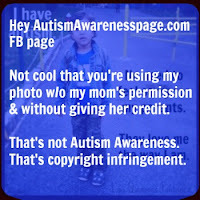 *Update 3/22/13: Last night, the Facebook page removed the uploaded photo of my son and shared it from my Facebook page. And they apologized. I accept their apology and I am grateful that they did the right thing. Though it's upsetting by what it took to get it. And over the last several hours - I've read comments that have really hurt. Someone posted that I am the cause of my son's autism because I did drugs. Well, I don't do drugs and um autism isn't caused by drugs. There is no known cause for autism. Someone posted that I wanted the picture removed because I was scared of immigration. Which was not only insulting but amusing because I was born in New York City. But even if I were born in Puerto Rico - I'd still be an U.S. citizen. 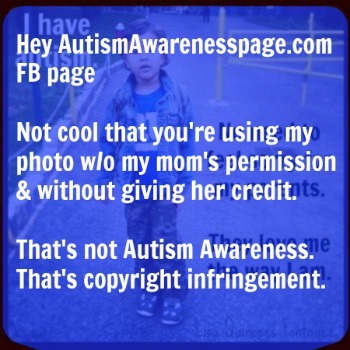 Someone posted that I shouldn't care about being credited and it didn't matter that I didn't give consent, I should just be grateful my son's picture is being shared to raise awareness. I've been called petty and argumentative, accused of exploiting my kid and not concerned with raising autism awareness. I've been told that if it's on Facebook, it's 'fair game' and that if I didn't want anyone sharing my photo then I shouldn't have put it on the internet in the first place. I have questioned whether or not I have the right to blog about my son. And after this experience, I don't know if I can ever use my son's photo again. 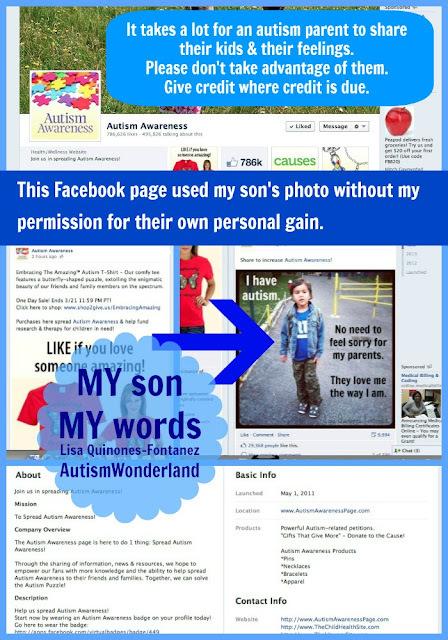 At the end of the day - a photo of my child was intentionally downloaded and then uploaded to a Facebook business page, Autism Awareness, without my consent and it was captioned, Share to increase Autism Awareness. Even though they failed to share my photo. This page is a for-profit business page however it's buried under links and links of several charity pages. This Facebook page attempted to use a photo of my son for their own financial gain and to drive traffic to their sites. I'm a working mom, college student and writer who maintains this blog for free. I don't have a staff, I'm a one woman operation. Thank you so much to everyone who helped me! So grateful for your support and encouragement. THIS Facebook page used the above picture of MY SON without my permission and without linking to my own Facebook page. And they had the nerve - the nerve! - to caption it: Share to increase Autism Awareness! The irony: They didn't share it from my facebook page. They didn't share it from the Parents Magazine Facebook page either. THIS sorry Facebook page uploaded the photo as if it were their own. Well. The page that stole my photo is a business. And on this page...MY photo has been shared more than 12, 000 times. It has more than 35, 000 likes. The page itself has over 786 thousand likes. Mine doesn't even have 2, 000. This Facebook page is a nameless, faceless business page looking to make money selling t-shirts and bracelets for Autism Awareness. But in the process - they stole my a photo of my son and my words without my permission. And they are the ones who will profit. Not me. And not my son. I don't get paid for writing this blog. This blog has been a labor of love. We're a working class family, struggling to make ends meet. I'm also a student. And while I may get paid to write for Parents.com and Babble.com - I'm not ready to quit my day job. I'm not making Dooce dinero. I sent them two private messages. NOTHING. I posted on their wall. NOTHING. Well I reported them to Facebook for copyright infringement. Would love your support until they take my photo down or at least tag my AutismWonderland Facebook page. Let them know it's not okay to steal photos without permission - click HERE. Let them know the photo belongs to Lisa of AutismWonderland - click HERE. I wish I could say this is the first time I've seen a big business Facebook page steal an autism mom's photo but it's not. And it's never okay. These are our words. These are our kids. Do not let a business trying to make buck take advantage of the small mom blogger who is trying to raise awareness. Sorry that this happened to you but glad you fought & won by having the photos removed & the apology. Now if they were REALLY sorry you would see some monetary remorse on their part....I cannot say enough was an inspiration you are! !